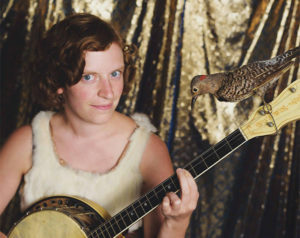 Bird City is the banjo/tenor guitar project of Jenny Mitchell, a Guelph, Ontario-based songwriter who previously performed as Jenny Omnichord and fronted the band The Barmitzvah Brothers among her many other musical projects. Mitchell crafted the debut album by Bird City, Winnowing, over a three-year period with producer/engineer Scott Merritt at his Guelph studio, with a host of notable friends contributing. These included Bry Webb (Constantines), Nathan Lawr (Minotaurs), J.J. Ipsen (Jim Guthrie, Two-Minute Miracles), and Merritt himself on a multitude of instruments. Tying it all together is Mitchell’s musical vision of creating out-ofbody experiences through stark fragility, no matter how many instruments are on a track. With Winnowing, Jenny moves beyond her quirky Omnichord persona, playing these exposed and poetic songs of paranoia, heartbreak and self-examination developed for nearly 15 years. Although she likes to describe her work as “tiny songs,” Winnowing is a towering achievement from an artist long considered one of Canada’s unsung treasures, who is poised to at last get the recognition she deserves.